I was delighted to be invited to present in Italy (REGENERATION Edition 2 in Dro, Trentino) and Scotland (SEDA Green Drinks in Ayr) recently on insights from FutuREstorative, updates from the LBC Cuerdon Valley Park project and in the case of many at SEDA, introduce the Living Building Challenge. This entry was posted in comment, sustainability and tagged Ayr, Bullitt Centre, Cuerdon Valley Park, Denis Hayes, Dro, Earth Day, fairsnape, FutuREstorative, GreenDrinks, Italy, John Muir, Living Building Challenge UK Collaborative, REGENERATION, Scotalns, SEDA, sustainability on April 27, 2016 by martin brown. The free-to-attend carbon neutral virtual exhibition dedicated to Europe’s most successful and greenest building projects and green building solutions opens on June 10th. Following on from the success of last years ExpoC21, (Sustainability Made Cool – my blog review here) the format for this year, under the title of Brightest! Greenest! Buildings, is very different. The Expo will run over a number of months with an evolving focus and a great Schedule of Events. The launch of Brightest! Greenest! Buildings EUROPE 2015 on 10 June 2015 includes presentations by Delta Development Group, C.F. Møller, The Carbon Trust, MIPIM’s Innovation Forum, OVG Real Estate, Europe’s Green Building Councils, BUILD UPON: Co-Creating Europe’s National Renovation Strategies, launch of baseEUcities, and many more! Brightest! Greenest! Buildings EUROPE 2015, as a virtual exhibition has been designed and organised an international team to promote the greenest building projects and associated solutions in Europe. Our exhibition and conference will reach 50+ countries in the European market in a very efficient manner. Last year, we had the participation of over 1500 of the greenest and most successful real estate investors, project developers, designers, green building consultants and rating tool assessors and other services as well as and technologies, products, and materials providers. Organized under the patronage of the European Commission, Brightest! Greenest! Buildings EUROPE 2015 is very low cost for exhibitors, free for attendees, eliminates travel time and the associated carbon emissions, and benefits from the support Green Building Councils across Europe as well as other expert organisations. From our current partnerships and future efforts, we believe we will easily reach our target of 10000 high quality attendees and strong media coverage during the 12 month exhibition period. Our introduction brochure and website – www.BrightestGreenestBuildings.eu – provides all the information about the event, the great organizing team, and the promotional plan and highlights from last year’s event. Booth features are described in the “Why Exhibit” section. Exhibitors can also configure their virtual booths in just a couple of hours using their existing promotional material. We invite you to take a demonstration tour with our team of the virtual trade fair platform to see first hand how this works. Tours are scheduled at 3:30pm (Central European Time) on Tuesdays and Wednesdays and at 10:30am on Fridays. Please note, the deadline to register to exhibit for the 10 June launch event is 29 May 2015. As in 2014, the UK Living Building Challenge Collaborative will have a presence at Brightest! Greenest! Buildings EUROPE 2015, join us on the 10th June and throughout the exhibition! This entry was posted in events, green buildings and tagged built environment, construction, Europe, green build, Living Building Challenge UK Collaborative, sustainability on May 27, 2015 by martin brown. One of the more interesting and potentially industry game changing announcements coming out from the ILFI 2015 conference in Seattle last week was the launch of The Living Product Challenge (LPC). There could be reservations with a requirement for LPC accredited organisations to hold other ILFI standards such as Just and Declare, seeming a little incestuous perhaps. However sticking to the LBC approach of philosophy first, advocacy second and accreditation third, lets focus on the philosophy and advocacy to improve the sector, and address certification issues later. Living Product Challenge is looking to operate in an increasingly crowded healthy material transparency and green directory arena, yet the absolute-ness of the criteria, (you do or you don’t) will undoubtedly differentiate. Buildings that consists solely of products and technologies that themselves do more good than harm, across environmental, social and economic spectrums, in manufacture, construction and in use is a very powerful statement for a regenerative future. And its an approach of course that responsible organisations within the built environment should be adopting. And here are a whole new set of questions to ask; before designers specify materials; when contractors procure products and as facilities management upgrade/replace products. Re-imagine the design and construction of products to function as elegantly and efficiently as anything found in the natural world. Products are informed by biomimicry and biophilia; manufactured by processes powered only by renewable energy and within the water balance of the places they are made. Products improve our quality of life and bring joy through their beauty and functionality. Imagine a Living Product whose very existence builds soil; creates habitat; nourishes the human spirit; and provides inspiration for personal, political and economic change. Net-Positive Waste: Water use and release from manufacturing the product must work in harmony with the natural water flows of the site and its surroundings. Net Positive Material Health: The product must be safe for human exposure during manufacturing, use and end-of-use. Human Thriving: The product must contribute to an active, healthy lifestyle and be designed to nurture the innate human/nature connection. Product Fit to Use: Durability, warranty, and useful lifespan must have a direct relationship to environmental impact and embodied energy. Equitable Product Access: Products sold to consumers must be affordable to the people who manufacture them, and products used in buildings must not unduly impair the affordability of those buildings. 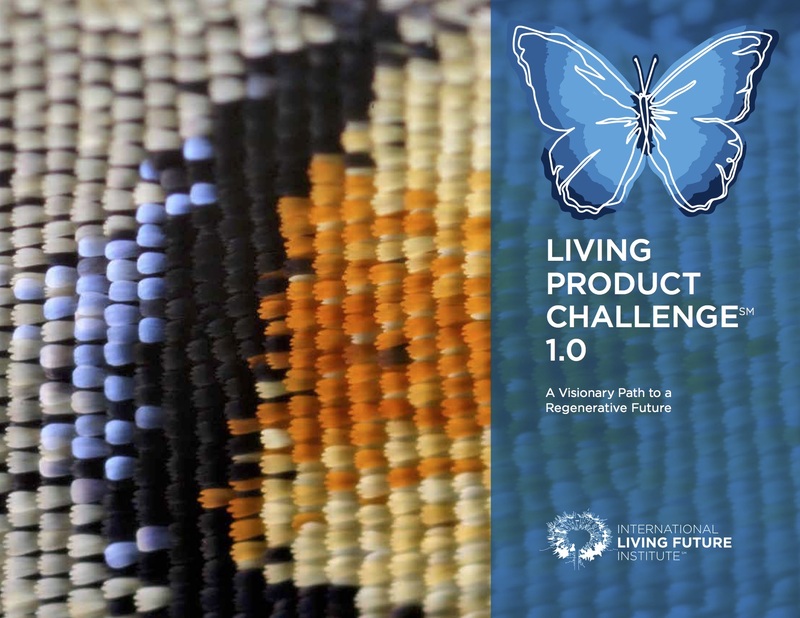 The Living Product Challenge ‘brochure’ pdf can be downloaded from here. The UK LBC Collaborative will be getting to grips with the LPC over the coming weeks, with a view to providing more information and introduction sessions later in the year. This entry was posted in comment and tagged Biomimicry, biophilia, construction, ecological footprints, ecological handprints, FutuREstorative, healthy materials, LF15, Living Building Challenge, Living Building Challenge UK Collaborative, living product challenge on April 7, 2015 by martin brown. This year the World Economic Forum identified “water” as one of the top 5 biggest societal and economic risks for the next 10 years. Climate change is affecting the water cycle, with water variability increasing and extreme events (floods and droughts) becoming more common and increasingly costly. The impact that the built environment has on water management in just about every other sector is significant, making water performance of buildings a corporate or social responsibility issue. Yet, in the UK we are experiencing floods and water shortages, restrictions and droughts more frequently, so rethinking water, in design, in construction and in building operations can only be a good thing. The UK Living Building Challenge Collaborative has been exploring the Challenges’ Water Imperative and developing an overlay or interpretation guide for UK projects and clients looking to adopt Living Building Challenge approaches. The Water Petal intent is to To meet all water demands within the carrying capacity of the site and to mimic natural hydrological conditions, using appropriately-sized and climate-specific water management systems that treat, infiltrate or reuse all water resources on-site. “Water Demands” One theme emerging, from the work of this group and my visit to a number of LBC projects in the Pacific NW is that we need to rethink water and the performance of buildings in water management, giving it the same focus as we do energy. Not to see water as an additional design criteria, but to be at the core of design, calculating and seeking ways top reduce water load, as we would with energy. Reducing ‘water load’ for a building use can be achieved through waterless or composting WC’s such as those in the Bullitt Centre or though recycled water systems such as the busy VanDusen botanical garden visitor Centre in Vancouver. “Net Positive” – LBC projects will be water net-positive, for example, via the large underground (56k gallon water tank) the Bullitt Centre can survive for 104 days without accessing mains water, the CIRS building can supply grey water to adjacent buildings. Systems that treat Good buildings will treat all water on site, ensuring no leachates and other nasty’s run off into the ground, into water systems, just as trees do, and as trees did that most likely stood on the site in the past, ensuring the aquifers remained as pure as possible. Thinking beyond SUDS, Constructed wetlands can and arguably should be incorporated into the structure of the building as well as being part of the landscaping. Viewing buildings as a system of interconnected buildings is key to integrated design, rather than seeing each as stand-alone buildings. Here great synergies can be gained, moving reclaimed or harvested water from one building to another to meet need, using buildings as storage or as filters for others. And, on drinking water The WELL Building Standard for Water requires and promotes safe and clean water through proper filtration and other methods, requiring the appropriate quality of water for various uses. Again without harmful chemicals or materials. So on World Water Day, a call to UK universities with a strong built environment and sustainability programme and values. Make your next university estates project a sustainable water building, along the philosophy of the Living Building Challenge, as a research project as the CIRS building does, or as a demonstration of what is possible – core to the Bullitt Centre remit. Influencing and inspiring the next generation of built environment professionals is so important. This entry was posted in comment and tagged #worldwaterday, FutuREstorative, Living Building Challenge UK Collaborative, water, well building standard, World Water Day on March 22, 2015 by martin brown. Seattle, Vancouver and Squamish: a sustainability visit. Having just returned from a visit / tour of sustainability projects in the Cascadia, NW pacific area of Seattle, Vancouver and Squamish, combined with a outdoor vacation, I am now sorting copious notes, photos and observations from the trip that will form future blog posts and inclusion in my forthcoming book, FutuREstorative. The lack of snow inhibited any real winter sports without really venturing deep into backcountry. I was later to learn that this year ‘pineapple express’ wind and low snowpack levels will have an adverse affect on water aquifers across the region. Walking and biking in forests where bear, cougar and coyote roamed and (worryingly, so early in the year) had been spotted during our visit introduced a fission of alertness not known in the UK or Europe and made for interesting discussions on re-wilding the UK countryside! A return visit to the Austrian House at Lost lake Whistler, a Passive House gift from Austria to the 2006 Olympics and Canada’s first PH registered project. Meeting with Sustainable Leadership Conversation co-host and friend Andrea Learned who took me on a great cycle tour through her ‘hood – the Seattle Ballard area and along the Waterfront with stop offs at the Tractor Tavern (home of garage and grunge) Stone34 (Leed Platinum Brooks HQ) finishing with great social media / sustainability discussions over dinner. Visits to Living Building Challenge projects, the CIRS building at University of British Columbia, the Bullet Centre in Seattle and the VanDusen visitor centre Vancouver as well as understanding other notable sustainability buildings such as the MEC HQ in Vancouver and Stone34 in Seattle. Whilst in the Bullitt Centre it was fun to to provide a live update back to and converse with the Living Building Challenge UK Collaborative water petal workshop in Leeds. But it wasn’t just the big restorative sustainability concepts that inspired, often it’s the small but awesome detail that is essential in reinforcing the messages, like the CIRS building on UBC where the solar aqua filter plant room is positioned at the entrance, viewed by all entering the building as a reminder. But perhaps the best message being in CIRS café area where two vegetarian meals are served for each meat meal, reinforcing the message of the resources in land and water to provide the meat meal compared to that of the vegetarian. It was of course great to visit the Bullitt Centre and question behind the stories covered on the web and numerous articles; it really is an inspiring building and lives up to its green reputation. But now the real challenge starts – “to replicate the Bullitt Centre a thousand, a million times and fast” Over an iced tea with Denis Hayes we discussed the real possibility of a Bullitt Centre type project in Manchester as the hub for iDSP, the Institute for Design Space and Place. Many inspiring chats and discussions gave insights into restorative sustainability for example with Tim Herrin at CIRS, with Brad Khan who really knows the Bullitt Centre inside out, with Denis Hayes, with the LBC team (great to meet and catch up with Amanda Sturgeon, Eric Corey Freed, Hilary Mayhew, Stacia and Bonnie) and, completely by chance, at a Vancouver dinner party, a planner involved in the LBC certified Childcare facility at Simon Fraser University. An evening meal with Ken Carty, author and retired political scientist at UBC provided interesting insights into Canadian politics. But who would of thought that Cows would feature in my tour. Denis Hayes kindly gifted me a copy of his new book Cowed co-written with his wife Gail Boyer Hayes. Cowed provides a fascinating insight to how Cows impact so much both on our lives and the environment and was a great read on the long flight back from Vancouver. This entry was posted in green buildings, sustainability and tagged #sustldrconv, Andrea Learned, Brad Khan, Bullitt Centre, Cascadia, CIRS, Cowed, Denis Hayes, FutuREstorative, Living Building Challenge, Living Building Challenge UK Collaborative, outdoors, Patagonia, rewilding, Seattle, Soo Downe, Squamish, Vancouver, water on March 17, 2015 by martin brown. This entry was posted in comment and tagged fairsnape, Living Building Challenge, Living Building Challenge UK Collaborative, martin brown on November 20, 2014 by martin brown. Integral Revolutionary Engineering – a review. Every now and again you come across a book that is both simple and profound, full of ah ha moments, of innovative ideas and yet seemingly familiar. One such book I have mentioned often on this blog (and gifted to many) is Yvon Chouinard’s “Let my people go surfing” to which Integral Revolutionary Engineering book published by Ecotone has a similar feel. 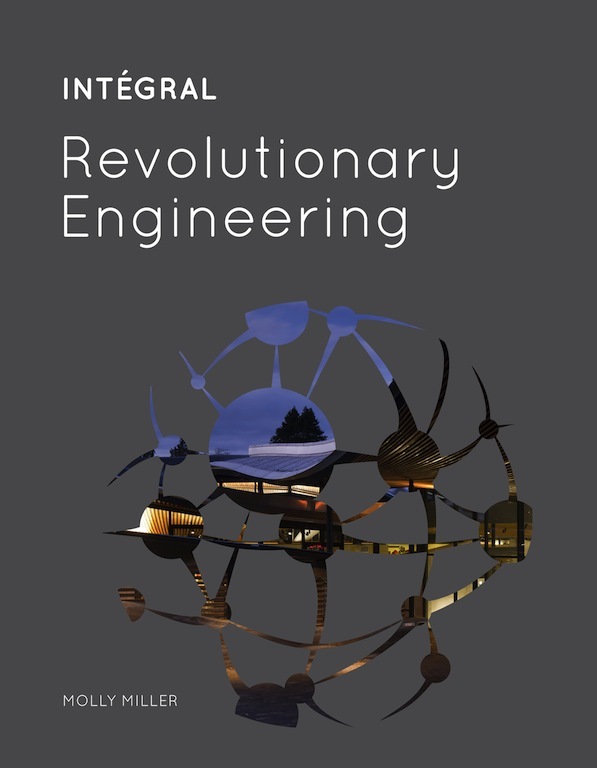 I had the opportunity to meet and chat with Kevin Hydes at an Inetgral reception at EcoBuild this week, and picked up a copy of Revolutionary Engineering. Kevin served as the Chair of the USGBC 2005-2006, was a founder and director of CanadaGBC and a former Chair of the WorldGBC and is Founder and CEO of the Integral Group. And it does what it says on the lid, providing a portfolio of the Integral Groups experience of design on deep green buildings, an insight not only into what is possible today but what is highly achievable in the future. That the forward is written by Jason McLellan (see bio) gives the clue that this a treatise of building services design on Living Building Challenge projects. And there is a nice affinity here. Leeds, where we founded the UK Collaborative for Living Building Challenge is also Kevin Hydes’ home town. Now residing in San Francisco, Kevin reminisces in his preface letter on a post industrial Leeds, with belching coal fired power plants and coal from Yorkshire burning in his very home. Times have changed, in Leeds and in sustainable construction since then. Molly Miller (@miller_mm), author, is Integrals story teller with a background in sustainability writing at Rocky Mountain Institute and Mother Earth News. And what a great title – why doesn’t every company have someone with the story teller title, official or otherwise?. In conversational tone, Molly includes many Kevin Hydes insights scattered and emphasised throughout, alongside quotes and comments from many other green build thinkers and project team members. As I read Revolutionary Engineering, I was looking for hints as to how BIM would fit in, yet, found it refreshing that BIM doesn’t feature. Although I am sure it must have been used to some degree on the large Hospital projects and Empire State Building refurbishment case studies. … refreshing to read a book with Revolutionary in the title that doesn’t try to sell BIM as the panacea for all things design and construction, even green construction. The character of innovation relies on different ways of thinking and a homogenous group is just not going to provide that. Integral are participating (exhibiting and talking) at the Construction21 Green Build Virtual Expo in May, prior to then, I will be in conversation with Integral as part of our EXPOC21chat tweetchat series. This entry was posted in comment and tagged 1:5:200, be valuable, BIM, book review, Clif Bar, Construction21EXPO, Integral, Jason McLellan, Kevin Hydes, Living Building Challenge, Living Building Challenge UK Collaborative, Molly Miller, Revolutionary Engineering, Storytelling, Yvon Chouinard on March 9, 2014 by martin brown.